Meatball Recipe: The Best Ever Easy Homemade Oven Baked Meatballs Recipe! This easy meatball recipe has become one of our favorite quick meals. You don't have to brown the meatballs ahead of time - just mix up the meat, form meatballs, put them in a baking dish, mix up the sauce, pour it over top, and bake! This dish freezes well. You might want to make a double batch: one to eat tonight, and one to put in the freezer for another time. This is a great dish to take to a sick friend, or to a family with a new baby. We like to eat this with mashed potatoes. The sauce is delicious over warm mashed potatoes! Combine the ground beef, bread crumbs, milk, salt and pepper in a bowl. Place in a single layer in a baking dish. In another bowl, combine the water, onion, maple syrup, Worcestershire sauce, cider vinegar and tomato paste. Bake, uncovered, for 1 hour, or until the meatballs are no longer pink inside. Use soy milk or another non-dairy milk in place of the milk. Use white vinegar, wine vinegar or your favourite vinegar instead of the cider vinegar. Experiment with different spices. What about adding some oregano or thyme to the meat mixture? Try another flavouring instead of - or as well as - the Worcestershire sauce. How about bottled steak sauce, or barbecue sauce? 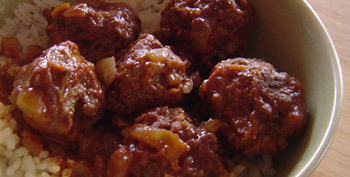 If you prefer crisp meatballs, brown them in a skillet before putting them in the baking dish. Use either your clean hands or a meat baller to form the meatballs. The meat baller will make uniformly shaped and sized meatballs - and your hands will stay clean in the process. Using your hands might be a bit quicker, and you can make the meatballs whatever size you want. Cooking time will vary, depending on the temperature of the meat and the size of the meatballs. Ensure that the meatballs are completely cooked, either by using a meat thermometer or by cutting open a meatball to check that there is no pink remaining. The internal temperature of the meatballs should be at least 160F/71C. Bread crumbs will stay fresh for a long time in the freezer. There is no need to thaw them before adding them to the meat mixture. Return from meatball recipe to beef recipes.